The recent case of the now former Philadelphia Eagle Josh Huff has sparked a number of phone calls to our law firm about permits to carry a concealed handgun in Pennsylvania and New Jersey. Sadly, people often assume that a permit to carry in one state like Pennsylvania extend that privilege to other states like New Jersey. This is simply wrong and could lead to a serious criminal charge if police stop you and you don’t have the necessary permit. The Commonwealth of Pennsylvania (VUFA) and the State of New Jersey (Graves Act) both maintain strict gun laws but each jurisdiction treats a permit to carry a handgun differently. In addition to these requirements the applicant needs to obtain a permit to purchase a handgun or a Firearm Purchaser Identification Card. The applicant must also demonstrate “thorough familiarity” with the safe handling and use of a handgun through an approved firearms training course. Even if the applicant satisfies all of these requirements, a Superior Court Judge for that county in New Jersey must approve the issuance of the permit. If the permit is issued, its only good for 2 years and renewal applications are subject to the same requirements. 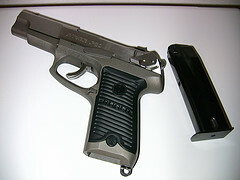 The bottom line is that obtaining a license to carry a handgun in New Jersey is extremely difficult, if not impossible. The term “may issue” is really just another way of saying “wont issue.” Pennsylvania, however, unlike the Garden State is a “shall issue” state similar to Virginia, West Virginia, North Carolina, Ohio and a large number of other states. This means that while a person needs to obtain a license to carry a handgun, the Granting Authority (Sheriff or Police Chief (Philadelphia County) has no discretion to deny an applicant provided that he or she meets the necessary character and fitness requirements. Unlike New Jersey, there’s no requirement that the applicant demonstrate “good cause” for the weapon. While an applicant in Pennsylvania doesn’t need to demonstrate “good cause”, law enforcement has 45 days to conduct an investigation into a person’s background to determine eligibility.